Radiology relies on referring physicians ordering imaging exams, but it also needs appropriate documentation and coding information to get reimbursed for those exams. That puts it squarely in the best interest of imaging leaders to communicate with their referrers on what they need for precertification or to maximize the likelihood of prompt, accurate reimbursement. It’s also true that referrers will rely more on information from imaging to meet ICD-10 documentation requirements for diagnoses. That means imaging facilities and their referring centers have a mutual interest in providing the appropriate information needed for creating clean orders and claims. As discussed in this month’s E-News Exclusive, having that discussion now while you’re planning for ICD-10 implementation should help reduce documentation calls, e-mails, and faxes next October. If your imaging facility has difficulty matching documentation now, expect it to be worse when ICD-10 implemenation kicks in on October 1, 2014. That’s what experts are saying—OK, it’s one thing they’re saying—about the oft-delayed transition. Radiologists and referring physicians, as a result of the implementation, will need to provide each other with more information for accurate billing and coding. It’s both a challenge and an opportunity for imaging facilities. On the radiology side, reports need to include all information that supports the diagnosis codes in a given patient encounter. Attending physicians will rely on information that radiologists provide to meet ICD-10 documentation requirements for diagnoses, says Cortnie R. Simmons, MHA, RHIA, CCS, CDIP, director of ICD-10 services for Kforce Healthcare Solutions. 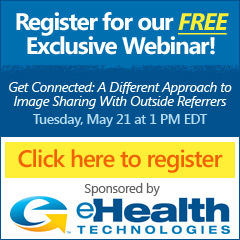 This complimentary webinar illustrates how getting connected with outside providers produces greater availability and faster access to medical images. We’ll cover how to replace manual distribution of CDs with easy uploads and direct image transfer and how to enhance the connected relationship by managing requests, providing notifications, and guaranteeing delivery. Plus, learn to enhance your relationship with referring physicians by delivering images with reports to all providers at any location along with real-time collaboration. To register for this free online education event, click here. Two studies published in Radiology—one with ultrasound and one with MRI—are sparking debate among radiologists about the use of supplemental imaging for breast cancer detection in high-risk patients, including those with dense breasts. Researchers at the University of Pennsylvania’s Perelman School of Medicine found that CT colonography may expand screening for colorectal cancer in older patients and was used appropriately in the study. Researchers at Boston University School of Medicine have shown that using MRI to measure blood flow over atherosclerotic plaques could help identify the risk of thrombosis, offering a noninvasive diagnosis for patients with atherosclerosis. Fund managers have left two major health care mutual funds, perhaps reflecting uncertainty about the future of the market where these funds trade, The New York Times reports. Radiology Today is mobile for iPhone, iPad, and Android users! Visit www.RadiologyToday.net/digital on your phone's browser to view the mobile version of this issue and bookmark us for future issues.